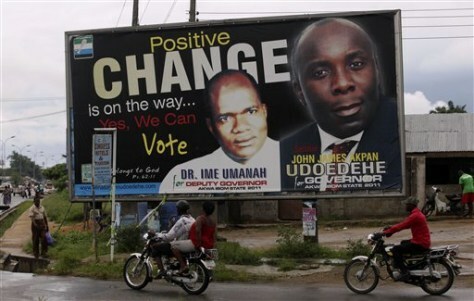 Motorcyclists ride past a campaign billboard of John James Akpan, of the Action Congress of Nigeria, in Uyo, Nigeria, on April 25. Only a week after the presidential election sparked riots that left an estimated 500 people dead, voters are being asked to cast ballots Tuesday for their state governors. Concern about renewed violent upheaval already has prompted officials to delay two elections in the volatile north, and some voters and poll workers now plan to stay home for fear that holding another poll will inflame tensions.